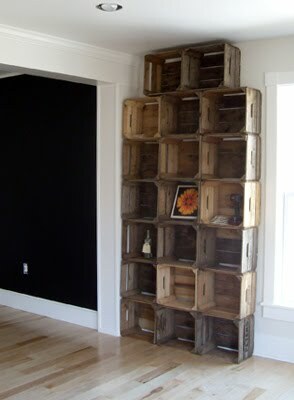 I had a request for an updated photo of the floor-to-ceiling apple crate shelves in our living room. This was the best I could do. We temporarily have a large trunk in front of the lowest shelves to thwart any thoughts Johnnie might have of climbing them, so the full top-down shot isn't that great right now. (She has never tried climbing them, but I'm not willing to risk it.) I also didn't tidy up before snapping photos, as you can see, but if you squint a little you can get the idea. Here they were the day we stuck them in. I scrubbed each one with soapy water and let them dry before we stacked them. Securing the crates. The last time I wrote about these (exactly three years ago to the day! ), the crates were just stacked on top of one another and not secured. I filled them with books and random stuff anyway. And honestly they stayed that way without issue until Johnnie started crawling about 10 months ago. 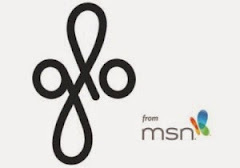 We thought about all the different ways we could connect and secure them, and they all sounded annoying and labor intensive. So Ez just dug out the stud finder, did a little measuring and screwed each crate to the stud behind it. See the screw, right above Anna Karenina? The screws are hardly noticeable from across the room, but, really, crate shelves aren't meant to be subtle anyway so I don't think it'd matter. Where to buy crates. 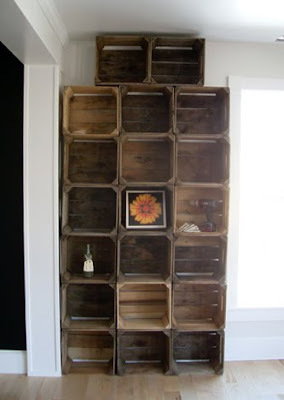 I get lots of emails asking where to buy old crates. I always recommend avoiding antique stores and flea markets, where you'll pay a lot more than necessary. I suggest searching for an orchard in your area -- the kind of place you can go apple picking. Our local orchard sells perfectly aged crates for $3 to $5 each, depending on size. If you live in Maryland, email me and I'll send you the information for our local orchard. So really, that's it. So easy -- and after three years I'm still not sick of them, so that's a bonus! Those are great - I think I'll have to visit all the apple orchards around here come fall and see what I can wrangle up. Visiting apple orchards sounds like a nice activity no matter what you come home with! I think they look crate! I love this look. Thank you for the tip about where to get crates. I was wondering where I could get some. Love this (and this is my first time seeing this - I guess I haven't made it that far back in your archives yet!)! I have a fetish for crates (as evidenced by my crate board on Pinterest)but have no where to put them in my current apartment...someday I will get to enjoy this look for myself! !